I have been caught in the rain in the United States before, arriving home with waterlogged shoes and clothes that drip-dry in the tub for hours. In Thailand, I have found a whole different level of storm. Walking along the street, the feeling of a few raindrops on my face will send me sprinting for an overhang. The storms don't ease you into things — there are no light drizzles that gradually turn into rain over the next twenty minutes. Nope, it's dry to soaked within a minute. 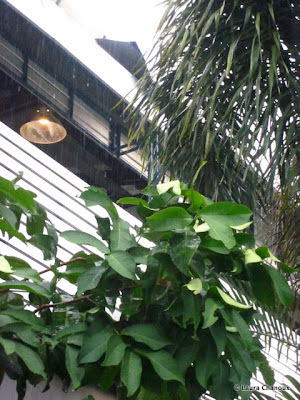 The wet season in southern Thailand starts at the beginning of May and goes through November. Depending on where you are, it will creep in, growing more and more intense as the months progress. So far some days have been gray and cloudy while others have been bright with the occasional fifteen minute downpour. I'm not sure what to expect as the season progresses. I took this without adjusting my shutter speed off "auto." The rain is just that intense. Playing with the shutter speed - the fastest it can go. before we devised an escape route. Rain drops falling around a motorbike. It looks like I'm going to have ample opportunities to improve my rain photography in the next few months. Do you have any advice on how to take great rain shots with a good quality point and shoot? (Specifically great rain shots without getting my camera wet?) Thank you in advance! Do you have any storm stories? Do you have rain photos? I'd love to see them!